Unfortunately, due to sales rights restrictions, we cannot offer Confederate Courage on Other Fields for sale in your country. 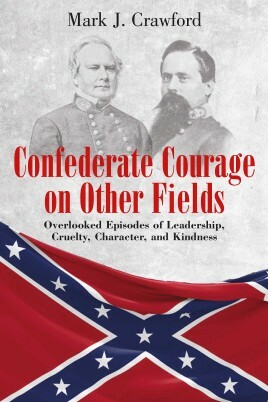 Confederate Courage on Other Fields: Overlooked Episodes of Leadership, Cruelty, Character, and Kindness offers four valuable but little-studied events of the Civil War. Each story explores the hardships of battle, and demonstrations of courage and other human attributes, away from the glare of well-known battlefields like Gettysburg and Shiloh. These previously untold or little-known stories compiled by Mark Crawford expand our understanding of this dreadful conflict—and of the human spirit. "Rebel Resort of the Dead” introduces readers to General Hospital Number One in Kittrell Springs, North Carolina, where hospital chaplain Rev. M. M. Marshall did his best to tend to the religious needs of severely wounded men. Marshall's recently discovered recollections are threaded throughout this moving narrative and include many of the last words of dying soldiers. "I'll Live Yet to Dance on That Foot!” offers the letters of Charles Blacknall, a wealthy plantation owner-turned-Confederate officer who penned candid letters back home that reveal not only an educated and passionate man, but one who is slowly being consumed by war. The astonishing tale of a personal conflict between a Union major and a Confederate colonel unfolds in "An Eye for an Eye.” The quarrel, which quickly became deeply personal, resulted in a series of vicious retaliatory killings, guerrilla warfare, the eventual intervention of president Abraham Lincoln—and the murder of one of the officers. The story of the Battle of Dinwiddie Courthouse, a bitter battle during the closing days of the war in Virginia, is told through many first-person accounts in "The South's ‘Sunset Charge. '” In this fight, the prelude to the better-known battle of Five Forks, Federal troops put up a stout fight, despite being heavily outnumbered, with the help of their deadly repeating carbines. Few know that many Confederate soldiers were swept away and drowned there in a valiant charge across a muddy rain-swollen river.